Since 1989 this specialised flute restorer in Paris, France, has had contact with flutes and exceptional flutists. 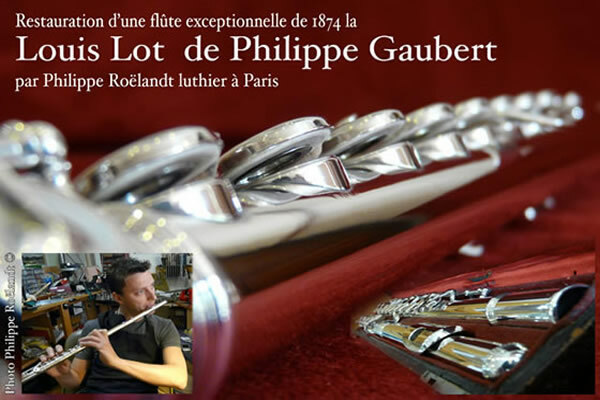 Then one day a very particular flute arrived in his workshop, the flute of Philippe Gaubert. Philippe Roelandt proposes to share with you the story of this exceptional restoration. Upon the death of Philippe Gaubert in 1941, the flute was plunged into a long period of solitude, hidden in its case. Then one day, Gaubert’s family decided to revive the flute and to have it restored. After consulting several eminent flutists in Paris, the flute arrived in his workshop. It is a great honour to have been entrusted with the restoration of Philippe Gaubert’s flute and I would especially like to thank the Poiré-Gaubert family for the immense confidence that they have bestowed upon me . The flute of Philippe Gaubert was a Louis Lot, no. 1986 made by the Maitre Louis Lot himself. Built at the end of the first generation of Louis Lot Flutes *, the flute was delivered to Gaubert in 1874. Approximately 120 flutes were made that year, of which 70 were in metal. The flute is made entirely of solid silver with a C foot joint, the tube and soldered tone holes, plus a B natural trill spatula used by the right hand facilitating the B key for trilling, normally used by the left hand thumb; we are in fact in the presence of a veritable Louis Lot (L.L.). There was just a modification in 1927, when Philippe Gaubert took the initiative of making changes in the riser and mouthpiece of his head joint to make a more ergonomic and comfortable fit and to adhere to more modern designs. This exceptional flute to which I devoted my absolute attention and care took more that 100 hours to restore. It was such an immense emotion which certainly constitutes the most unforgettable restoration in my last 20 years as a flute maker. Philippe Gaubert played this flute less than 50 years ago for a concert where he was accompanied on the piano by Maurice Ravel himself. The aim of this restoration was to recover the original state of the flute itself, and to go back in time to retrace the different techniques used when it was first made. A delicate task and very important fact because Philippe Gaubert’s flute had been repaired many times before and not always in the most correct manner. Furthermore the flute was restored for a special programming of concerts and expositions of Philippe Gaubert’s works at the Cité des Arts in Paris this year and to finally hear the original sonority of his flute. The dismantling of the instrument was done in the most meticulous way in order to inspect and analyse all the pieces that would have been worn down by the passing of time and would therefore have needed to be modified. Once the keys removed, and taken apart from their rods and pins, we had a perfect view of the whole ensemble of the instrument. Would there still be inside this magnificent flute some vibrations of this exceptional musician? Taking a closer look, one can easily recognise the familiar ways that Gaubert probably had of placing his flute horizontally on a surface. This is due to the varnished marks on the ornamental rings of the tube, witnessing the great age of the flute. The tube itself seems to be straight with some dents, revealing a light warped curve and contortion of the barrel joint. As this extraordinary restoration also brought surprises; let us begin to see the key work in detail. Each key has its own particular and precise position in relationship to the rod; this determines its angle and height which indicates largely the position of the flutist’s hand and fingers. These precise positions give the exact sound of the flute, and for the flutist both response and velocity and as he identifies with the instrument enables him to express subtle emotions. Returning to the sad reality : all the keys on Philippe Gaubert’s flute had been deformed. Pads of diverse dimensions had been forced into each key which had been considerably too thick. This particular Louis Lot needs a very thin pad, which is more delicate to put into place, but incontestably determines the sonority of the instrument. A set of measured pads were made especially by hand with the thickness and to the exact criteria of the original ones in 1856. Each key had to be placed at its original angle and initial axis, this indispensable stage was so that the mechanism could finally acquire the custom-made pads for the Louis Lot. Today, we know perfectly well about the positioning of the Straubinger, Muramatsu- aluminum, and the Triad Nagahara pads...but as to inserting the old white Gold-beaters’ skin pad, sometimes twice as thin, with the only possibility of using white wax to allow it to stand straight in this magnificent Louis Lot key…? It was exactly the same case for the springs, some modern springs were found throughout the body and I did not wish to leave them in place : however finding some very good old spring needles (that easily prick the fingers of the flute maker)…we were able to adjust the angles, curves, and pressure, together with the content matter of the springs that are an essential matter in legato playing. Once the entire ensemble of flute parts had been returned to their original state, we would be able to work in detail with the flutist to reach his or her own particular artistic wishes. On the tube itself, the key supporting ribs, the rings and other soldered tone holes were soldered with pewter. This very well known pliable substance which can be heated at low temperatures is almost but not quite as solid over time as silver. What joy and relief to find that all the soldering on the Louis Lot were of the original craftsmanship. I do not intend any sarcasm, but I prefer to find an old, original soldering to re-do compared to a new soldered clump to clean up and refinish. We can easily verify if a part is on the verge of falling off, but first of all we must inspect the air tightness of the tone holes. Evidently inserting a perfectly made and adjusted pad inside a shiny silver key over a tone hole that leaks at the soldering junction is absolutely not useful in anyway. Fortunately, a sure but secret technique dating from same period exists today for verification. The soldering of the tone holes is not eternal and as expected some of the tone holes had to be dismounted and re- soldered. We can remark on one of the photographs the trace of the oxide pewter solder, representing a darker colour. The solder no longer adhered and had become porous, so it was no longer airtight. It only needs a very small surface to cause these leaks so I took this opportunity to consolidate all the other soldered tone holes on the instrument. Finally to redress the curved warp on the tube and some scattered dents along the instrument, we had first to consider that the tube was made from a rolled sheet of silver metal which was then soldered with silver. In craft-made Louis Lot Flutes, sublime for their sonority, nonetheless, the visible soldered bonding of the whole length of the tube was done with modified silver. It was a clever mixture of 40 to 80 % of silver with copper, so that the resulting alloy was able to melt at a lower temperature than silver, thus allowing the binding of the silver sheet. Therefore the soldering mixture being softer than the silver metal tube, it could crack or become porous when manipulated too violently in rectifying. Our second preoccupation was the thickness of the tube. The particularity of the silver tube on the Louis Lot is its refined thin width of measure and precision. It would be a great shame to flatten the dimension in rectifying the flute and would without a doubt modify the sonority of the flute. But fortunately there are simple (but time consuming) techniques, which enable us to exclude all risks in order to achieve a perfect result. I noticed that the ring on the head joint, specific to Louis Lot flutes and other rare makes of the same period, was not in its original position. Depending on its position, a soldered-on ring considerably changes the thickness of the tube of the head joint and is not without consequence for the sonority of the instrument. It was thus preferable to replace the ring in the exact original position where Louis Lot first adjusted it when he manufactured the flute. Once, deoxidised, the posts and rods were lubricated with oil which was of the same thickness as the original, thus we were able to mount the keys and adjust the mechanism. All the parts of the flute made from silver, rather a soft matter, were cleaned and polished by hand. This technique takes much longer of course than using products or different machines, but also this is the only procedure that prevents premature wearing and preserves the thickness of the precious silver metal. Understandably, the purpose was not to alter the sonority… but also, I consider that in restoration, a flute maker would not add on 5 minutes of machine polishing, in addition to a century of normal use, which could perhaps erase the original engravings on an instrument. The cylindrical tube was now straight, the tones holes solidified and airtight, the keys were now ready to be fitted with the new custom-made pads. The pads were fitted using white wax. A very precise quantity was placed in each key, this will determine the thickness of each pad with a precise overlap beyond each specific key… Yet again, this fact is very important and indispensable for the sound and is particular to the key work of Louis Lot flutes. Once the pad is positioned, it will then be adjusted to fit the tone hole perfectly. Traditionally, if flutists of older generations did not hesitate to press hard on a key to insure no leak, the key must perfectly embrace the tone hole. Today, flutes are extremely precise and we all can appreciate this mechanical “perfection”. As the modern flutist is accustomed to such precision, on this flute we took the necessary time for each pad, alternating with intervals to finally acquire a sensitive and stable adjustment. After so many hours spent in close contact with Gaubert’s flute, I have the impression I know it by heart. It had remained silent for so long in my company that I must admit the great pleasure I had to hear the flute play, little by little. The flute has not yet left the workshop, but I know that I will miss it. this flute, it will be engraved in my memory forever. Philippe Gaubert’s flute alternates between the Poiré-Gaubert family and the Atelier to ensure constant conservation. Translated by my great friend Patricia Nagle with Jan Pack .